We are in the Editing and Post Production Phase. Our goal is to complete and release the film to start the Dissemination Phase by March, 2017. Our Trailer is Live. Check it out and let us know what you think. 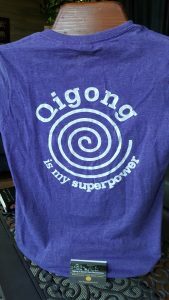 – “Qigong is my Superpower” Tee Shirts available to support the Short Film. – Great fun visiting Sydney, Australia with my son. The best part was the friends we made. – Off to Shawnee, Kansas. 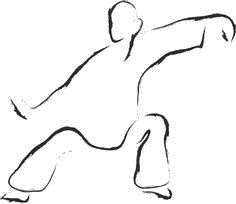 Hosts: Angie and Bill Douglas and members of the Shawnee Civic Center Tai Chi/Qigong group. – Boston, Massachusetts: interviews with major researchers. – EDITING and POST PRODUCTION work has begun. – We are on target for an April 2017 debut. 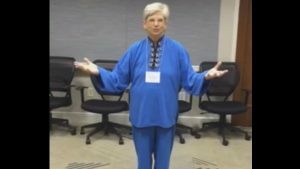 – Instructor Judy Bonafede and her class performing Guolin Qigong. – The first cut of the Short Film has been reviewed by our team. Final editing is underway. – We are buzzing with anticipation for its April 1, 2017, debut. To be inflexible to the change around you is to live in fear. 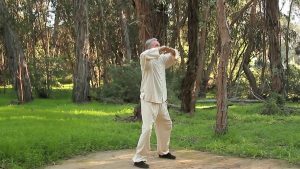 Qigong is a useful tool to improve your flexibility, both mental and physical.